New art has been added to the Sailor Moon official site showing Sailor Chibi Moon. At this weekend’s Animate Girl’s Festival in Japan the cast of Sailor Moon revealed art for the second season of Sailor Moon Crystal which will feature the Black Moon Clan and Sailor Chibi Moon. 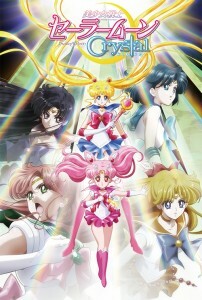 Though the art shows the transformed Sailor Guardian Sailor Chibi Moon in reality Chibiusa will appear at the beginning of the season, only transforming into Sailor Chibi Moon towards the end of the Black Moon arc. This is in contrast to the anime where Chibiusa did not transform until Sailor Moon S. On January 17th we’ll wrap up the Dark Kingdom arc and kick off the Black Moon clan arc with Act 14, An Ending and Then a Beginning – Petite Etrangère. A photo was added to the Sailor Moon Central Facebook page outlining the upcoming episode schedule. 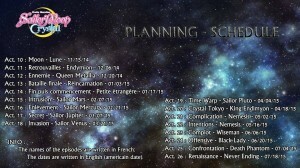 The schedule is in French but titles correspond to the Japanese titles from the manga. Until now all episodes, including next week’s, correspond to original Manga chapters. Some acts listed here do not correspond to original manga chapters however they share titles with the chapters listed for the manga rerelease from 2003 in Japan and 2011 in North America. By going along with the manga rerelease chapter names this means that the first two story arcs will span 26 episodes rather than the original 23 acts that the original manga spanned. This means we will not be seeing Sailor Uranus and Neptune as part of the 26 episodes which are set to be released as part of Sailor Moon Crystal’s first year run. No episodes beyond 26 have yet been announced. The anime referred to the second season as “Sailor Moon R” but no specific subtitle for this arc has been listed.